"Thank you for enabling Muay and I to obtain our fiance visa. 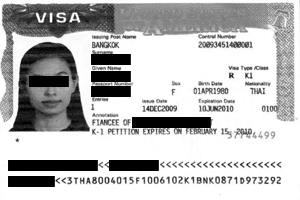 we could not have obtained the visa without your Knowledge expertise, preparation and personal care"
I would like to thank You and your very capable staff For enabling Muay and I to obtain our fiance visa. we could not have obtained the visa without your Knowledge expertise, preparation and personal care. Hiring your firm was the best decision That I made for our future together. We are now happily married and living in California! I highly recommend U.S. Immigration Legal Advisors to all couples wanting to obtain a fiance or marriage visa. U.S. Immigration Legal Advisors and the great staff will use all their skill and expertise to obtain your visa. It is very affordable and they take all of the stress and fear out of the process. Before you know it ,you and your Thai lady will be together. "U.S. Immigration Legal Advisors did all of the legal work with the filling, leaving me free to continue my business in California"